In favor of the latter, there is the fact that Clarke is a writer you read neither to explore the complexities of personal relationships nor to lose yourself in the purple prose of exotic lands. Indeed background is superfluous in Clarke’s prose, sparingly described when described at all; and his characters are there to articulate the many ideas that are struggling to get out of the author’s mind. It’s the ideas, of course, that you want to learn about and wrestle with. In this case, it’s the fate of humanity, and while I didn’t like Clarke’s interpretation, he succeeded in getting me to think about it and formulate some interpretations of my own. In a soundless concussion of light, Earth’s core gave up its hoarded energies. For a little while the gravitational waves crossed and re-crossed the solar system…. 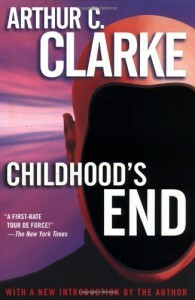 Concurrent with reading Childhood’s End, I read a collection of Clarke’s essays – Greetings, Carbon-Based Bipeds – and in both the author refuses to accept that humans are the endpoint of evolution. Rather it is “intelligence” in some form that will go out to conquer the universe (and in several essays he uses that very word). The stars may not be for Man but we are a stage on the road that leads to them. I happen to agree with Clarke that evolution is not a progressive process, and that humans are accidents of many improbable mutations. Turning back the clock 65 million years and letting it run again will not result in us. I also agree with him that if something leaves this solar system, it won’t be human, though it may claim us as an ancestor. The discomfort my brain suffers when I read Clarke comes from a philosophical difference. Perhaps “philosophical” is the wrong word. Perhaps it’s more a matter of perspective: Where he is a relentless optimist who sees a great and glorious future in intelligence united with technology, I can’t bring myself to believe that both aren’t rapidly becoming evolutionary dead ends. Derek Jensen’s Endgame severely shook my belief in the near-term viability of civilization; and the increasingly alarming trends in climate change and our response to them are eroding my confidence in the viability of the species. Even should we manage to overcome and create a sustainable culture on a still-inhabitable planet, who’s to say that our destiny is in the stars? Or just the planets, for that matter? For 60,000 years – give or take a few millennia – humans existed in complex, vibrant cultures and spread to nearly every corner of the globe without doing too much permanent damage to the planet. Even after the Agricultural Revolution (a big mistake in Jensen’s view), ecological overreach was localized and biotas could recover given time. Now, however, we’re at a point where our appetites have far outstripped the planet’s capacity to feed them, and there’s precious little evidence that we’re willing to curb them or even recognize the need to do so. My point is that there’s no “final destination” for humanity, and that I don’t think everyone would be on board for any single one. I wouldn’t want to live in Clarke’s “golden age” presented in this book, for example. It is my hope that humanity will go it its rest in peace, knowing that it has not lived in vain. From a certain point of view, this sounds like the Borg from Star Trek: Assimilate or be destroyed. At the end, I’m giving this three stars. My mind has been exercised for a week now trying to (however inadequately) put into coherent form the thoughts it’s engendered, and any book that can do that deserves a “like” at the very least.